We are currently in New York City staying at a hotel in SoHo. 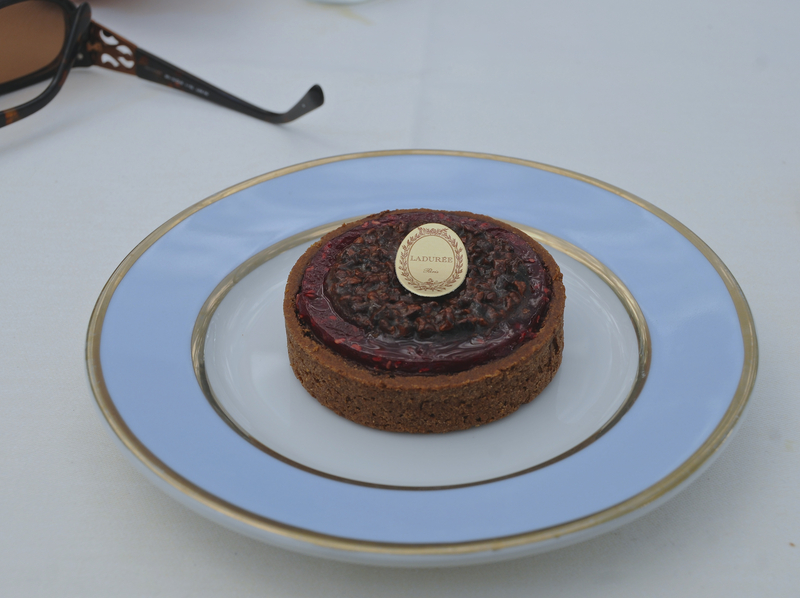 This afternoon we walked by the SoHo Laduree on Broadway (with lines down the block), which prompted me to finally finish out my Paris posts. Back to the birthday trip of two years ago. Once we returned from London we only had three full days left in Paris, and we spent the first two finishing up what sightseeing we could fit in. 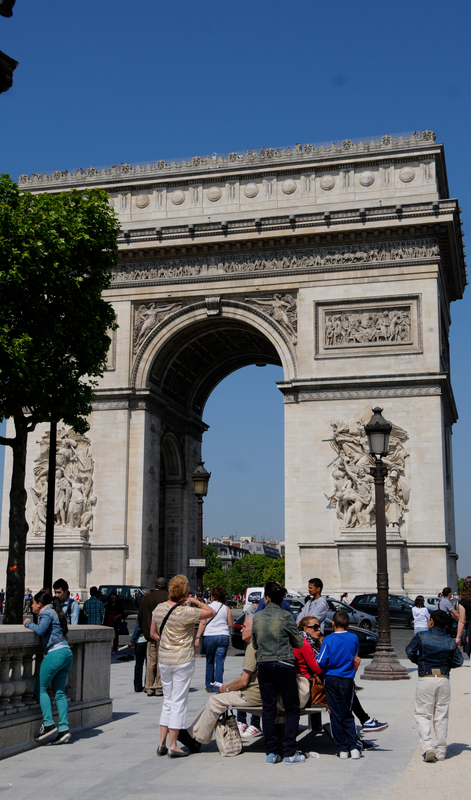 On Wednesday, we first headed to the Arc de Triomphe and the Champs Elysees. 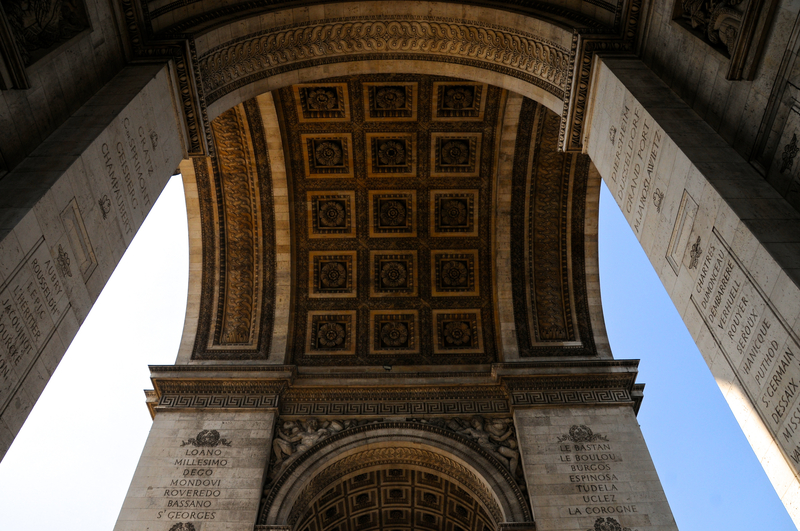 The triumphal arch honors those who fought in the French Revolutionary and Napoleonic Wars. 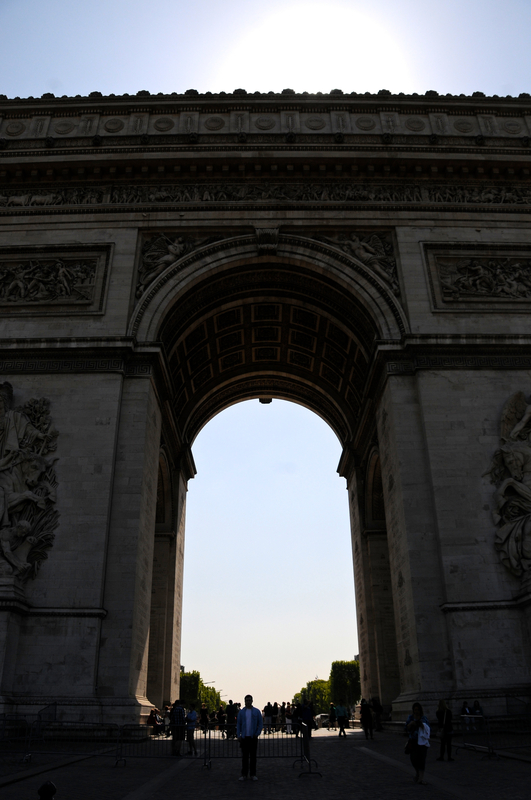 The names of all the French victories and the generals are inscribed on its inner and outer surfaces and the Tomb of the Unknown Soldier from World War I lies in a vault under the arch. The monument is monstrously large and below is a picture giving a little more size perspective. 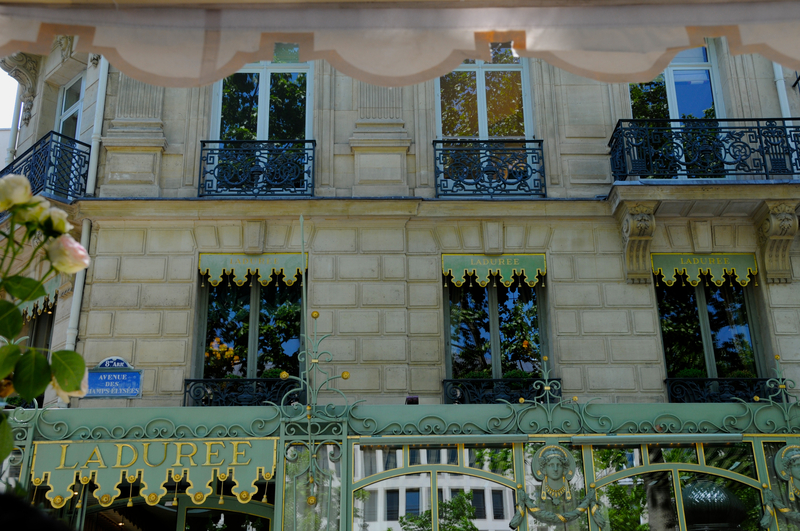 After visiting the arch, we headed to the Louis Vuitton store on Champs Elysees where I purchased a purse I had been eyeing. Normally I don’t mind a nice Made in the USA stamp on my consumer goods (it is so rare these days), but this LV Paris purse stamped made in France always makes me smile. I have been using it a lot lately. I took it on both big International trips this year, first to Japan, then to Europe. 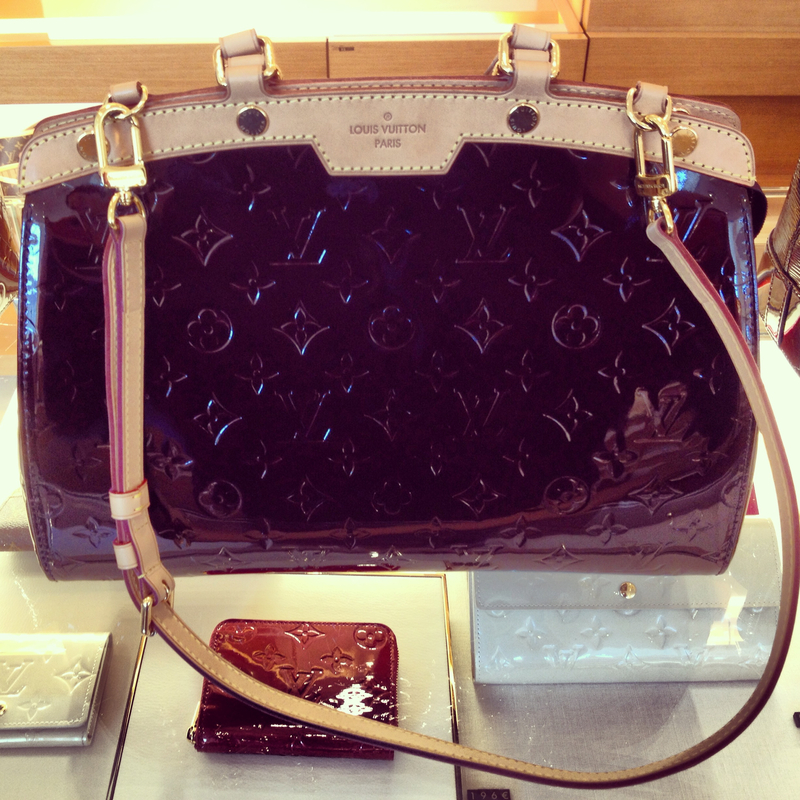 It was my first (and so far only) LV purchase. We also splurged and purchased the boys some clothes at a designer store nearby. 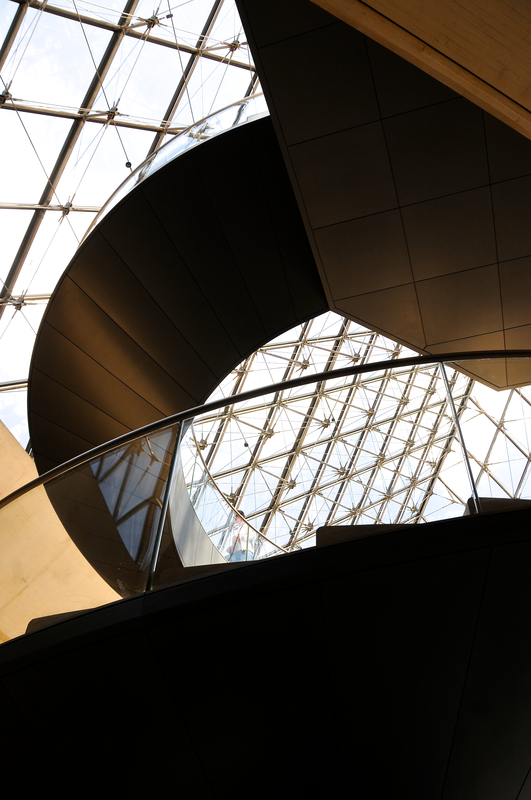 Above and Below: Inside the Louvre. 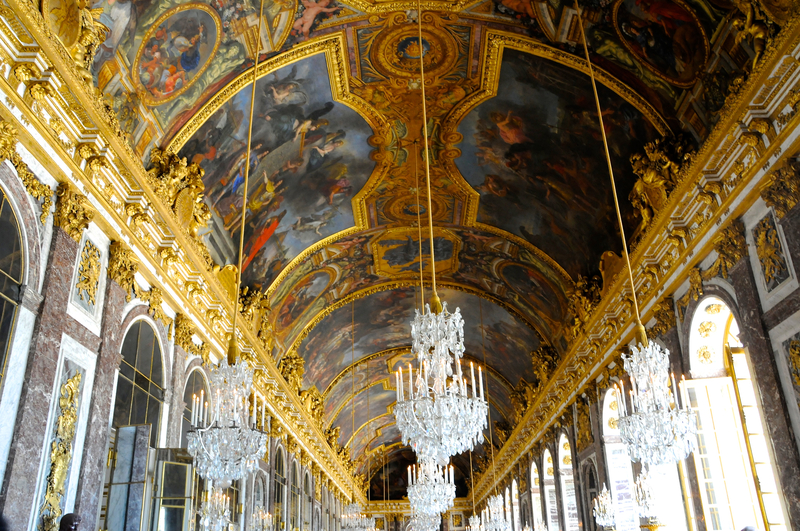 There is frankly just too much to be said about the Louvre to be covered in a simple blog post. 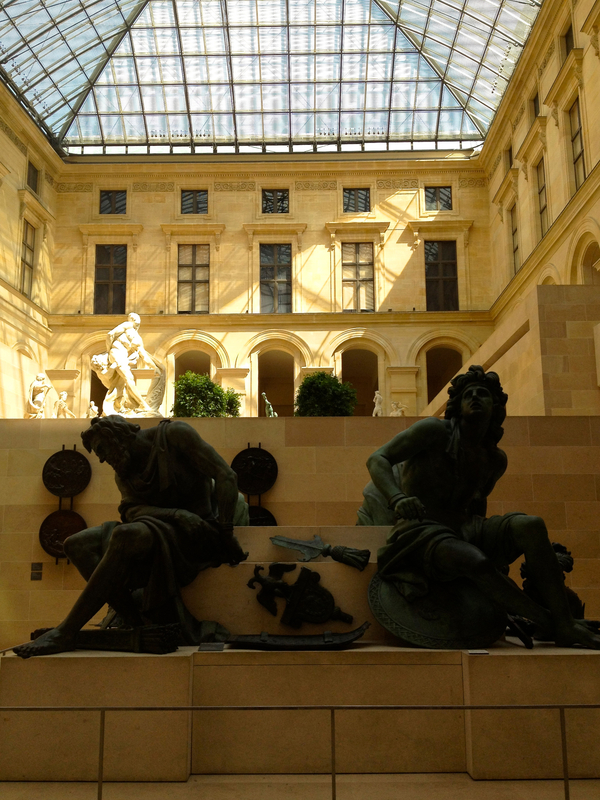 The museum is enormous and it is best to study the map and decide what you really want to see. We just saw as much as we could possibly see until we were exhausted knowing we would need to return another time to do the museum justice. I have included here just a handful of pictures from the dozens I took. 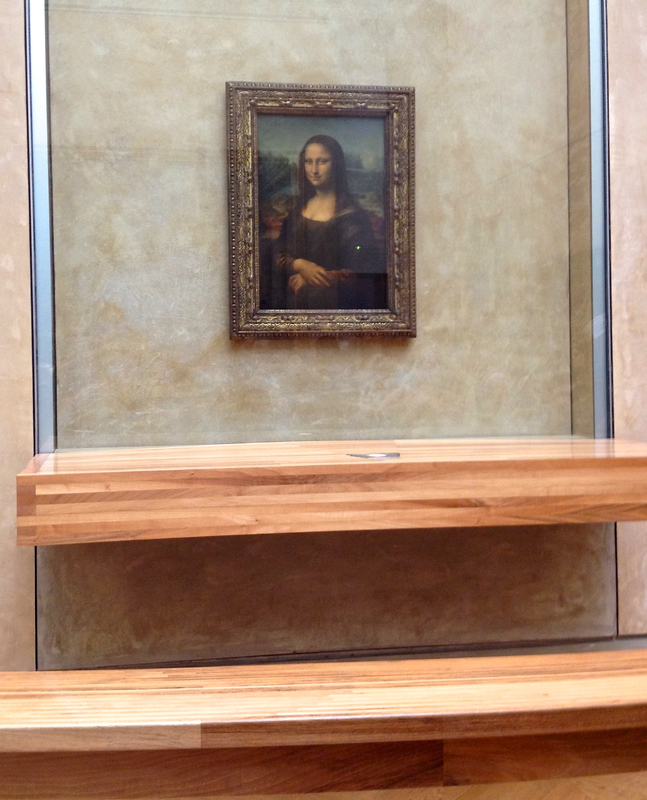 I have read and heard from friends that visiting the Mona Lisa is simply not worth it. That it is terribly crowded in the room and the Mona Lisa herself is quite small. We happened to visit the museum on a fairly slow day and getting up close and personal with the painting was not difficult. She was not as small as I was expecting (having read SO many times about how SMALL she is). She happens to be in a very large room surrounded by absolutely enormous sized oil paintings, so that doesn’t help with the optical illusion. She seemed like a regular old portrait sized painting to me and if she was in your house, you would certainly not call her the “size of a postage stamp,” as some of the books describe. 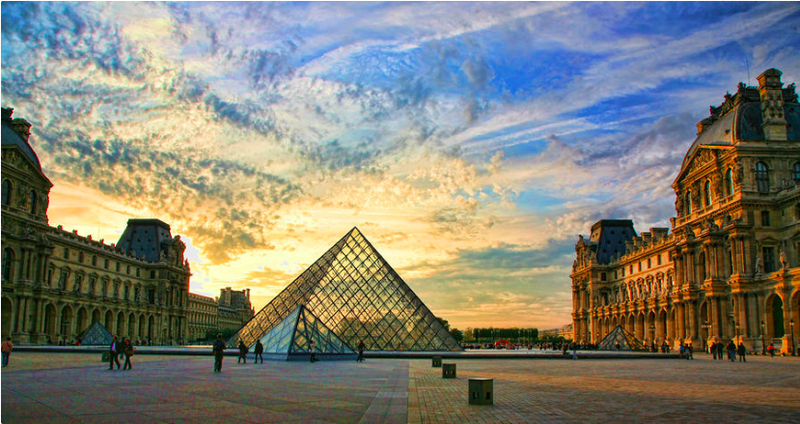 Can you really visit the Louvre without visiting the Mona Lisa? 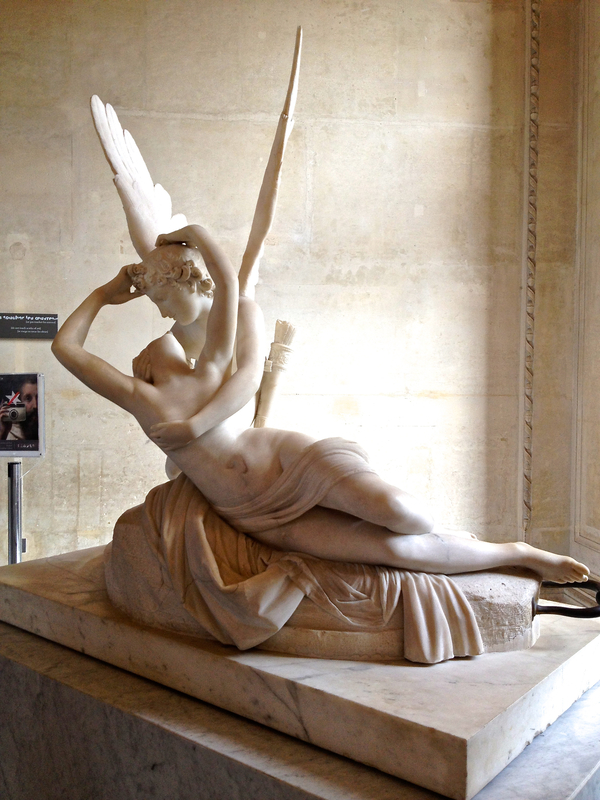 Above: one of my favorite sculptures, Psyche Revived by Cupid’s Kiss by 18th century artist Antonio Canova. 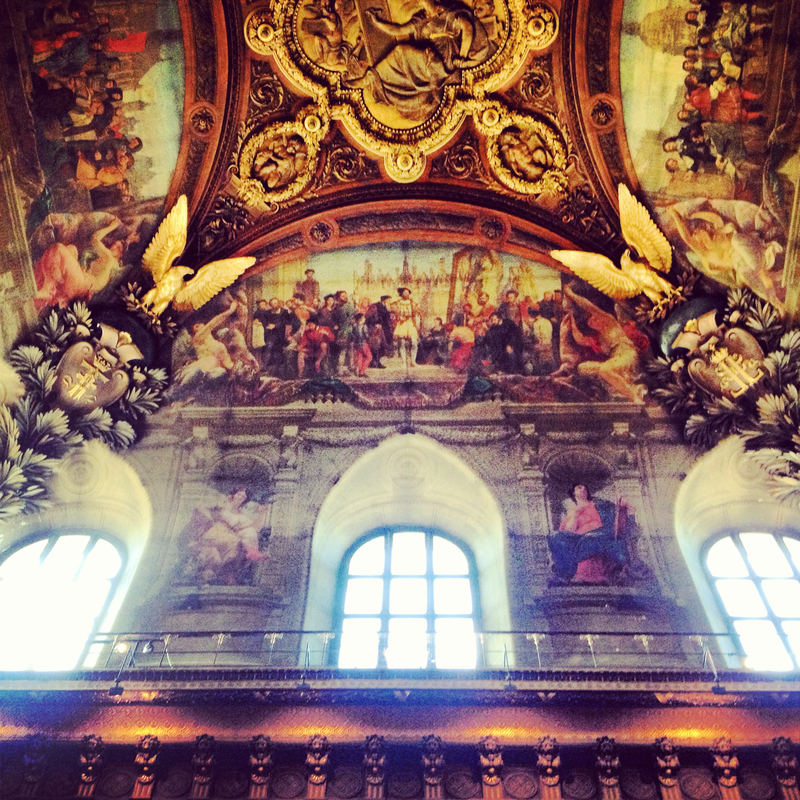 Above: one of the amazing ceilings in the Louvre, not sure which room, there were so many gorgeous ceilings. 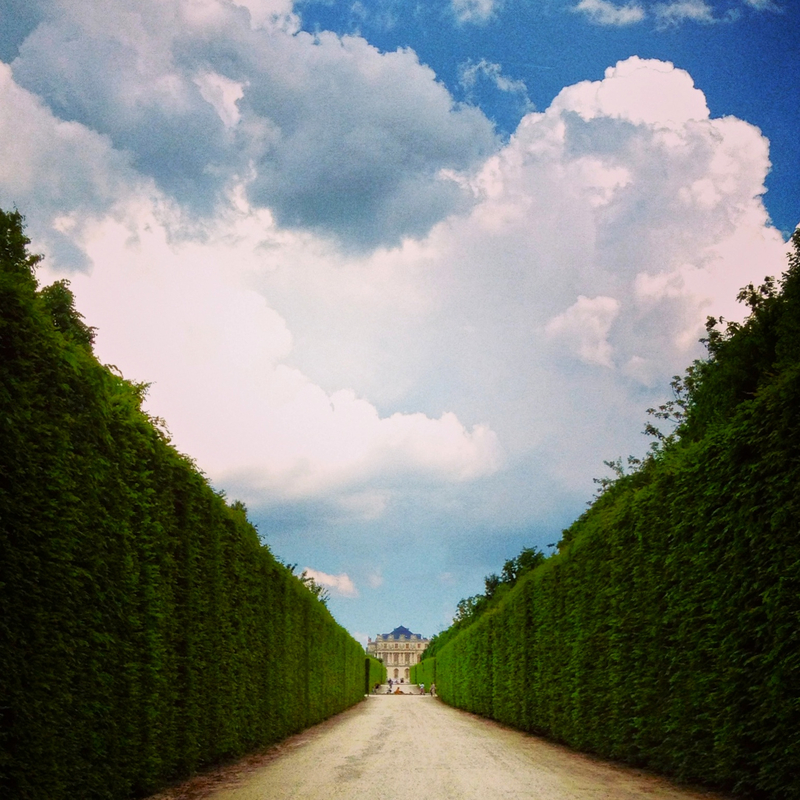 Thursday we took the entire day and headed to the Palace of Versailles. 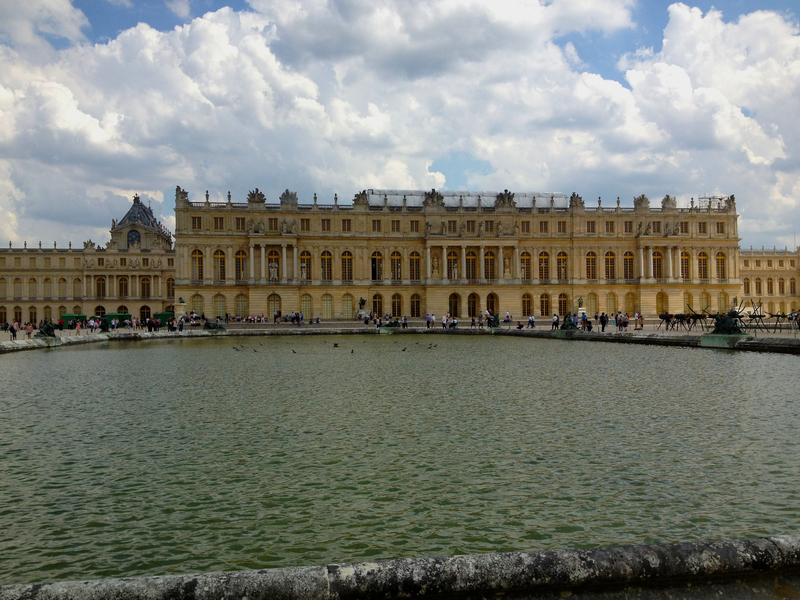 We took the RER C yellow line to Versailles-Rive Gauche and then walked the short distance to the palace. This has got to be one of my favorite days of the trip. The weather was mostly amazing although there was one freak rain shower in the middle of the day. 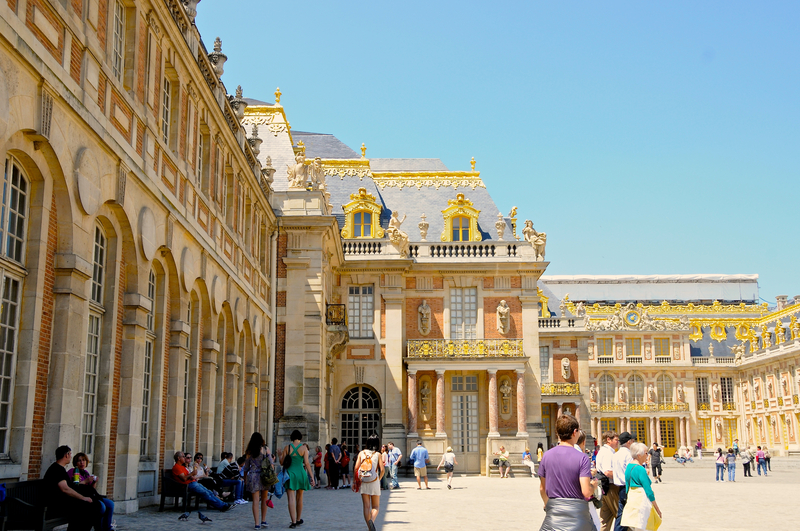 We purchased our tickets and our audio tour headsets and toured the entire Main Palace, the Grand Trianon, and the Petit Trianon plus walked around the vineyards and the gardens. We walked over 16 miles that day. 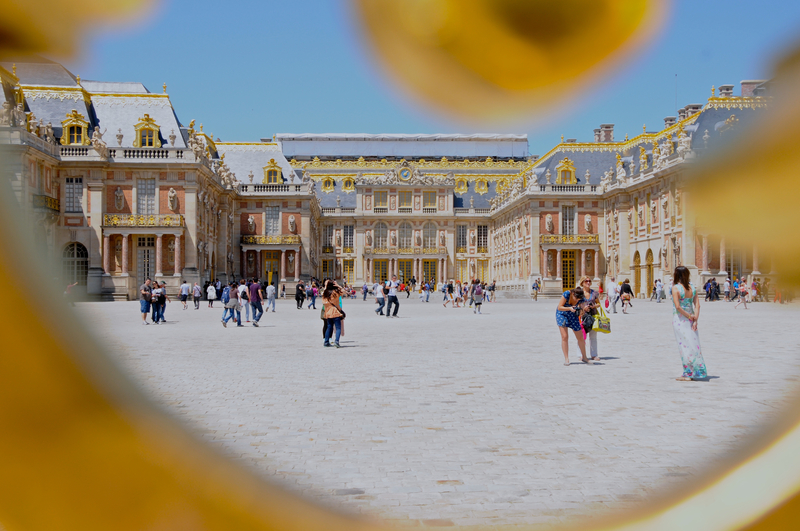 The palace was built and occupied by the Louis’ (XIII, XIV, XV, and XVI), but the most famous of the occupants was, of course, Marie Antoinette, wife of Louis the XVI. 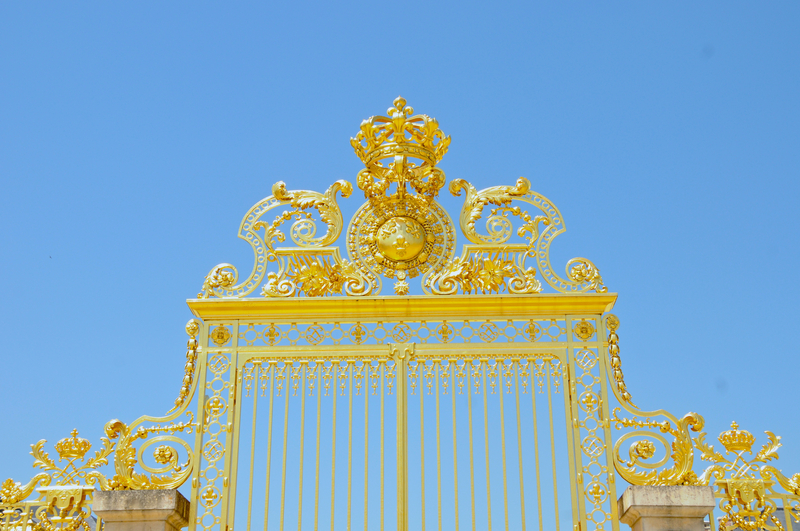 Above and below: the gold gates at the entrance to the main palace. Below: a corner of the exterior of the main palace. 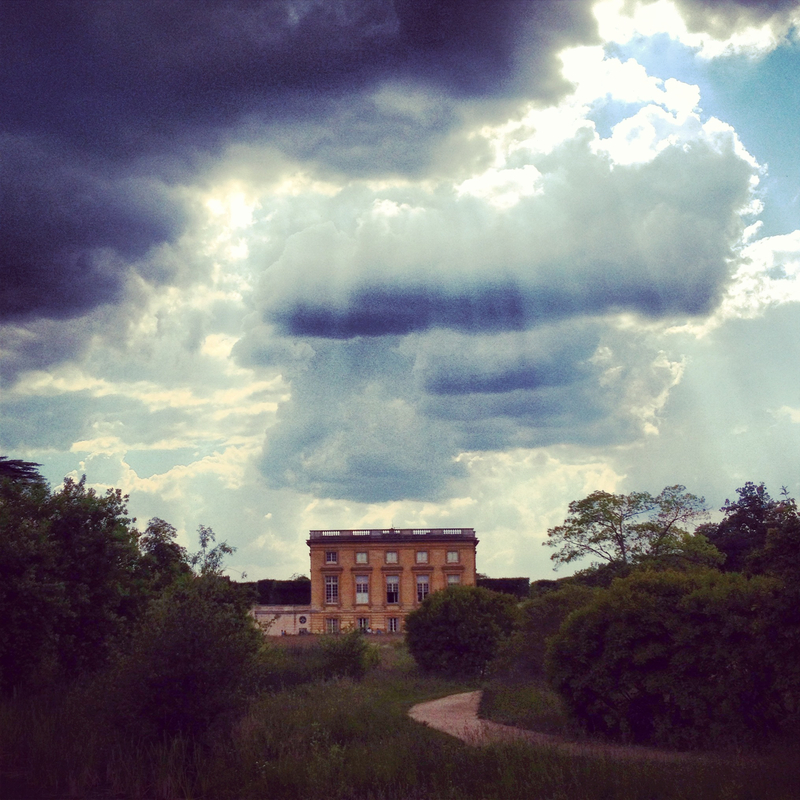 Below: a dark cloud descends over the Petit Trianon, best known as Marie Antoinette’s palace away. We ended up finding shelter on the grounds in a gazebo. There was a quick downpour, then sunshine again. 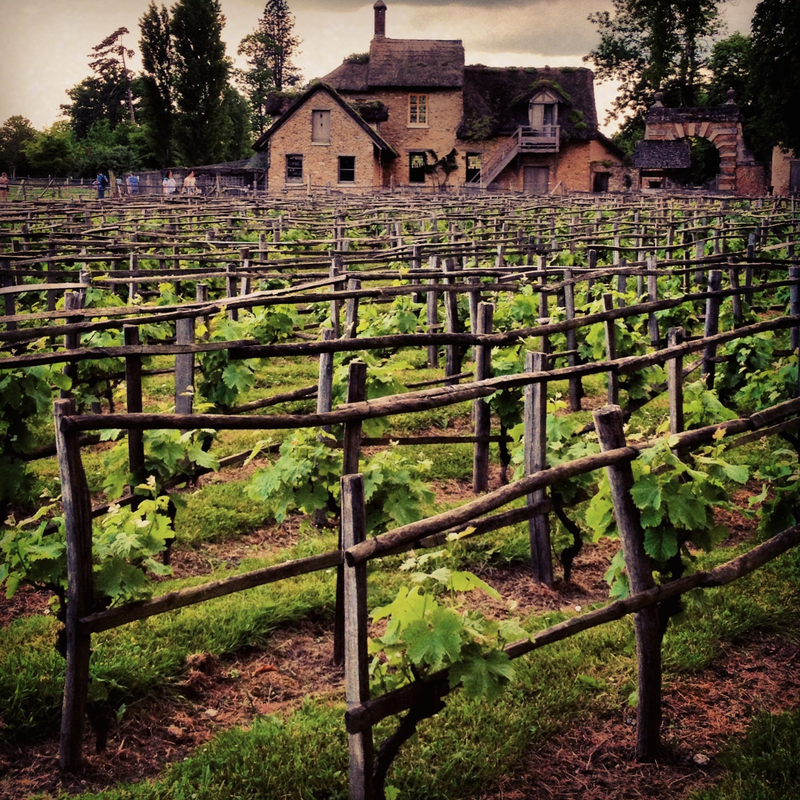 Below: The Queen’s Hamlet (constructed as an English style village and working farm was a refuge for Marie Antoinette to enjoy with her lady companions) included a vineyard. 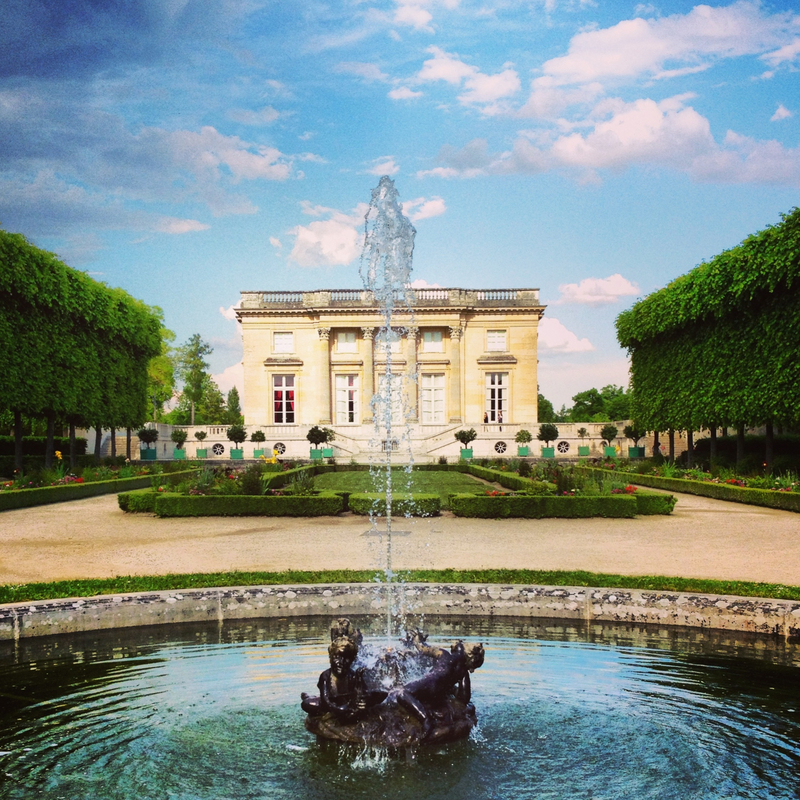 Above: this was my favorite place on the grounds, the garden side of the Petit Trianon. 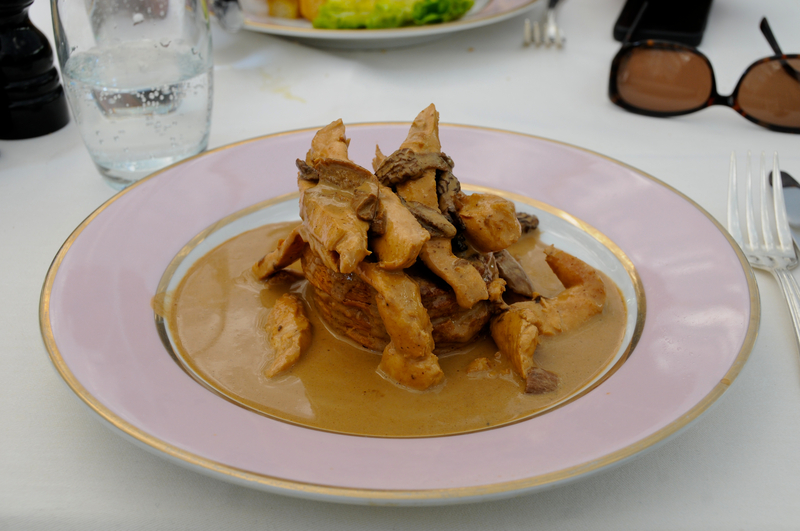 And then, we sadly reached the last day of our splendid two-week trip to Paris. On the final day, the kids headed to the modern art museum, the Centre Georges Pompidou. 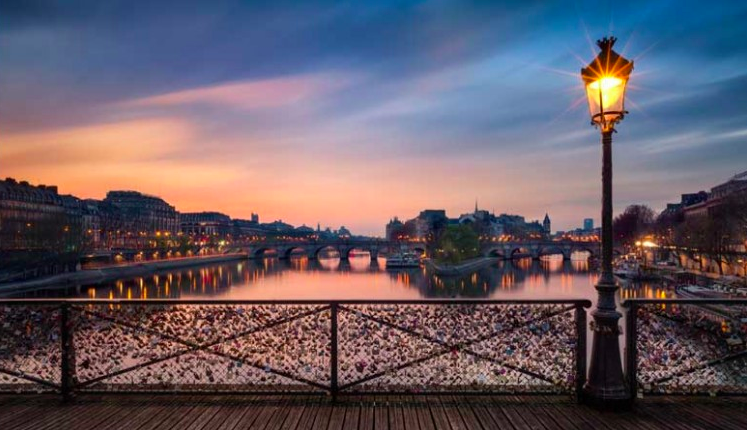 Blue Eyes and I wandered around purchasing some souvenirs, packing, and that evening we took a long, romantic walk through Ile Saint-Louis, across the Seine to the Shakespeare & Company bookstore, and then back across the Pont des Arts bridge where we enjoyed a beautiful Parisian sunset. Stroll the Rive Gauche (the Left Bank of the Seine, the path of authors and artists), Roland Garros (French Open Tennis), Musee D’Orsay, Palais Royal Gardens, Luxembourg Gardens, Musee Louvre, Walking the Ile Saint-Louis, Rue Saint Honore, Eiffel Tower (did not go to the top), Marais District (falafel, shopping, dining–our home for two weeks), Victor Hugo’s Apartment at Place des Vosges, French Crepes, Laduree, Champs Elysees Louis Vuitton Store, Chocolatiers, Viennese Chocolate Chaud at a street cafe, Steak Frites, Notre Dame, Saint Chapelle, walking tour of Montmartre including Sacre Couer, Moulin Rouge, the deepest subway in Paris, Arc de Triomphe, day trip to Versailles, Shakespeare & Company bookstore, purchase flowers for our apartment at the flower market, Saint Germain des Pres, Eurstar to London (Gare du Nord station). Musee Rodin, Shopping at Marche aux Puce de Saint-Ouen, Musee Picasso (it was closed for renovation), Centre Georges Pompidou, boat tour on the Seine, Eiffel Tower (to the top), Opera Garnier, Saint Sulpice, Musee de l’Orangerie, the Sorbonne & the Latin Quarter, Grand Epicerie at the Bon Marche (for luxury food shopping), Pierre Herme (for chocolate). Now I know, it is impossible to see it all in one trip! Loved the photos. May I ask what type of camera do you use? 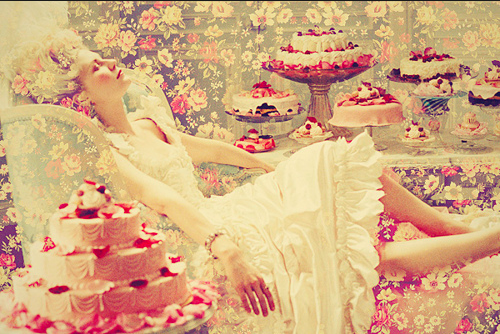 And I understand the “ignorant bliss.” Still trying to understand my new narrative. Howdy, Kit! Most of these photos were taken with my Nikon D300 that is about five years old now. It is incredibly heavy to lug around and I didn’t take it on our most recent trip. Some are taken with my iPhone (a couple of the iPhone photos have Instagram filters). Yes, the Pompidou is a must see for next time! Regarding the purse, it is aubergine and I adore it. I like all the traditional brown styles that everyone seems to have, but I never felt like I needed to spend that much for a purse, but then I saw the aubergine and fell in love! 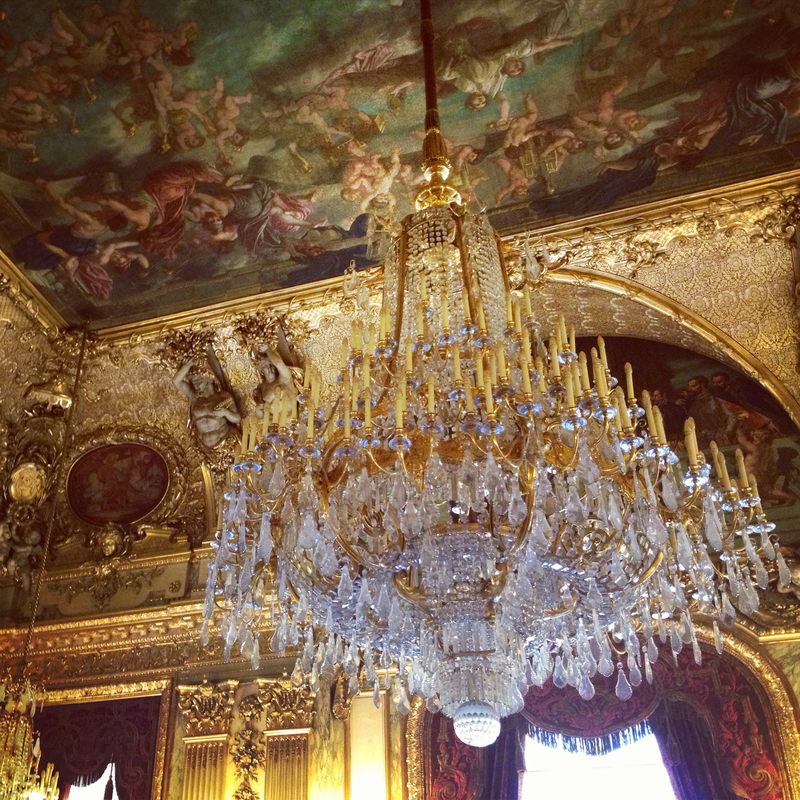 I can’t wait to get back to Paris, it is so magical. 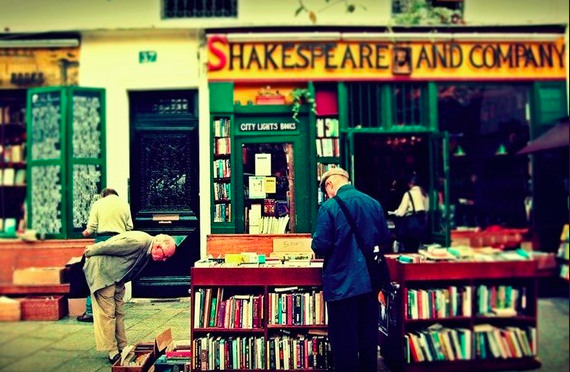 This 2013 trip was more than seven months before dday, so I wandered around in ignorant bliss.